Doors open at 7 p.m. / presentation starts at 7:30 p.m.
Join the Nature Conservancy of Canada (NCC) at the Queen’s University Biological Station near Kingston, Ontario, for an exciting glimpse into the future of wildlife tracking. Hear from expert scientists about new technologies that are providing us with more information about bird migration and habitat needs than ever before. Learn how an army of citizen scientists is helping biologists track and record birds across the globe via their cell phones, and find out how you can join the movement. This event is sold out. We appreciate your interest! 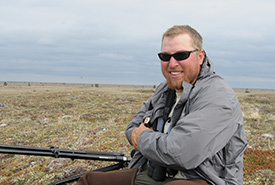 Stuart Mackenzie began exploring the natural world while still in the womb, and has been birding since the age of two. 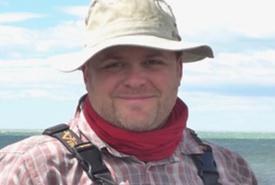 He is the director of migration ecology at Bird Studies Canada (BSC) and is responsible for the Motus Wildlife Tracking System, Long Point Bird Observatory and aspects of the Canadian Migration Monitoring Network. He has an MSc. in biology and decades of experience conducting, coordinating and managing monitoring and research projects on a wide variety of species. He is the president of the Ontario Bird Banding Association and chair of the North American Banding Council. Mike Burrell has been birding and been interested in nature since he was old enough to hold a pair of binoculars. He grew up outside of Waterloo, Ontario, with his parents and three siblings. He holds a bachelor of science degree and master of science degree from Trent University and the University of Toronto. He has conducted field work around the province with private industry, Bird Studies Canada and the Ontario Ministry of Natural Resources and Forestry. Mike works as a zoologist at the Natural Heritage Information Centre, tracking rare species in the province. He lives in Peterborough with his wife, Erica, and daughter, Abigail. Mhairi McFarlane grew up in Scotland, where she completed an honours ecology degree from the University of Stirling. She then completed her PhD in ecology from the University of Exeter in Cornwall. Her thesis was on the behavioural ecology of Cape sugarbirds in South Africa. She moved to Ontario in 2006, and had short contracts with the Ministry of Natural Resources and Bird Studies Canada before joining the Nature Conservancy of Canada (NCC) in March 2008. 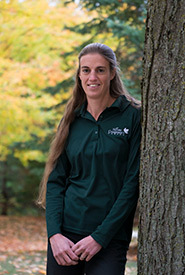 She worked as the conservation biologist for southwestern Ontario before becoming the conservation science manager for Ontario in September 2014. She has been managing non-native invasive species and conducting field-scale restoration throughout southwestern Ontario both with NCC and as a volunteer with the Thames Talbot Land Trust.